I was late, again. A terrible habit for anyone. But for a clock maker? Well, I wish I could say there was no excuse, but that’s not strictly true. There are dozens of excuses, all in my shop, waiting to be either fixed or wound. Clocks helped me lose track of, well, time. Since I not only worked with clocks, I lived with them, time was something that surrounded me, not something I was good at keeping. The Cog & Sprocket has only been my shop for a short while. I inherited it from my grandfather, Thomas Clagan. I got the horology gene from him, and spending summers in Orchard with he and my grandmother helped it bloom. He didn’t want me to call him Grandpa in the shop, so I called him G.T., Grandpa Thom. We’d had a rift before he died, so I’m working hard to make it up to him now, by taking good care of the shop, his widow Caroline, and the shop cat Bezel. All of which made being late all the worse. Pat Reed was waiting for me to wind the clocks in the shop. It was our Saturday ritual. Coffee from the Sleeping Latte, the shop his daughter Moira ran. Baked goods from his wife Nancy waiting for us once we were done. Coffee getting cold? Sweet buns waiting? I needed to get a grip. I ran down the stairs, excuses at the ready. The shop was empty, and I heard keys rattling at the door. I threw the door open, hoping to surprise Pat. Instead, I was surprised by my handsome neighbor, Ben Clover. “We’re waiting for you, Ruth,” he said. At least I think that’s what he said. With his dreamy blue eyes, sandy hair that fell down over his brow just so, perfectly fit jeans it was tough to focus on words. Especially before I had coffee. Swoon. I threw his coat over my shoulders, grabbed my notebook, and ran out the door. Not only was I late, I almost missed a meeting for a project that was my idea. “You get to chair the committee. Come on, there’s a room full of people who are waiting to hear what you need them to do.” Ben smiled, and rubbed his hands over his arms. I followed him off the porch, and down the side alley between our shops. I really needed to start being on time. Are you always late? Do you get everywhere early? Are you a just-in-timer? Let me know in the comments! 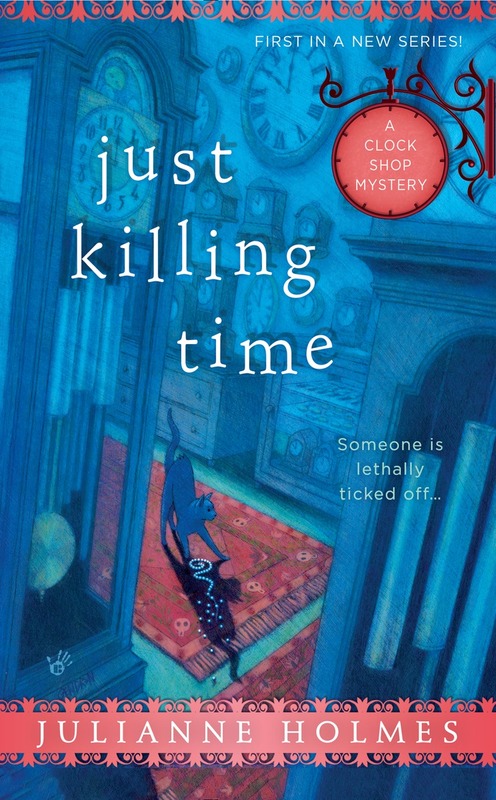 As part of the Cozy Up To Summer with a Killer Character Giveaway, I am offering a commenter (include your name and email in the comment) a copy of Just Killing Time, the first in the series. The second book, Clock and Dagger, comes out August 2. Check back on August 20th, and I'll offer a copy of that as well. Julianne Holmes is thrilled to be joining the Killer Characters blog the 20th of every month. She also blogs with the Wicked Cozy Authors, and on Live to Write/Write to Live. Join on her Twitter, Instagram, and Facebook as well. I'm always early! Thanks for the chance to win a copy! I never want to be late so I worry about it way too much. I am always early! Thanks for the chance to win. I am usually early myself. I hate being late. As long as I get all green lights, I'm usually early. Welcome Julianne. Would love to read this series. I'm always looking for new authors. mlarkin at rmrgroup dot com. Thanks for the chance to win! Look forward to reading this. I hate being late. It is a gene I inherited from my father, lol. I loved the first book in this series. Would love to win this second book. I'm always worrying about being late----so I'm always early. While I love to be on time my husband doesn't. He family is famous for being late. Lol this series sounds great, hope I win the first so the second will the twice the fun to read. Thank you for the opportunity. Yvonne Gilbert mommomsworld(at)yahoo(dot)com. I'm always early or on time. I hate being late and actually tell my husband the wrong time to leave so we can be on time occasionally. Haha! I'm a sucker for a cute cover and a whimsical title! I am a sucker for a great convert and a whimsical title! I usually try to get places a few minutes early in case of traffic. To me being on time means being 15 minutes early. I greatly dislike people who are late! This sounds like a great series-I'd love to both start and catch up! Welcome to Killer Characters, Julianne. I'm usually arrive early, I don't like being late and try my best to be on time. I am very punctual and like to wear a watch. Welcome! I don't like to be late. I like to be a bit early. Usually it works out for me. When I was young and in high school I was an "on timer". Then I discovered the excuse of fashionably late in college. When I had my son he hated that we were late a lot. Then I met my husband who is former military whose mind set is: if you are 15 minutes early then you are "on time" and if you show up "on time" by the start time then you are already late. We are usually 30 minutes early to everything! I try to be early where ever I have to be. Sometimes really early but then I just grab a book and wait and read. There have been times I've been late, usually because of traffic. I always tend to be early or on time. My Dad always said Be ten minutes early...I have tried to always do that. People drive me crazy that run late but I have been known to go out of the house still putting on makeup... thank you for the Contest. I have been wanting to read this series. My mother taught me that being on time or early is a sign of respect. My father was on time two days in his life: his wedding and his funeral. I get real nervous if I'm running late. I am always early! don't think I have ever been late, always been too early. thanks for the chance to win! Sounds intriguing. I am usually early. This series looks great!!! Thanks for the chance to win!!! I like the title Clock and Dagger. Sounds like an interesting setting. I enjoy the punny titles of cozies. Wow, thank you all for you comments! What a fun start to my Killer Characters adventures! Congratulations to Veronique Boudreau! I hope you enjoy JUST KILLING TIME. 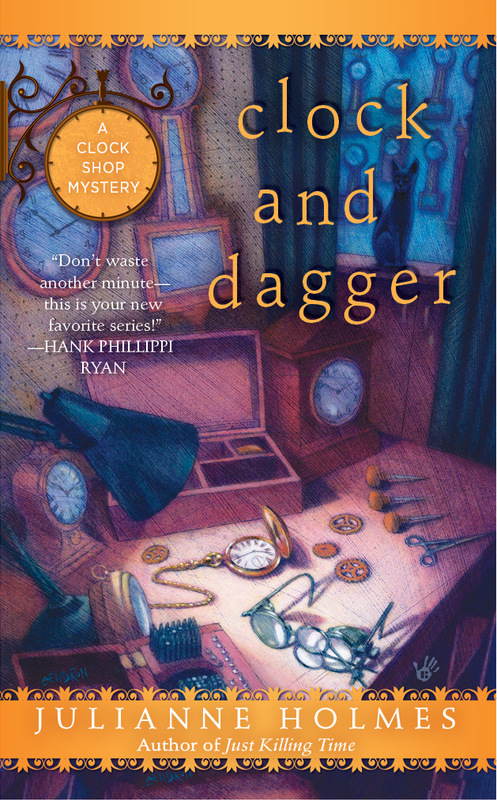 A reminder that I will be giving away a copy of CLOCK AND DAGGER in August! Thank you! I appreciate the opportunity, and am looking forward to reading!